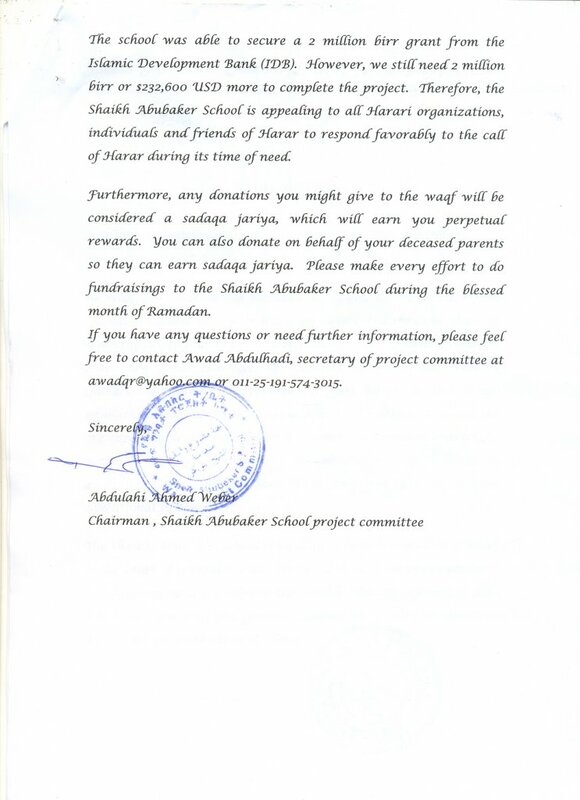 The Shaikh Abubaker School in Harar is undertaking an aggressive plan to tackle the chronic financial problems that it faces by constructing a waqf. The Waqf is a business center located next to Garad Building. Once constructed, the school will be able to support itself and grow. The waqf is being constructed by the generous donations of the Islamic Development Bank (IDF) and Hararis in Ethiopia. However, the school is still facing serious shortages of fund to complete the project. Therefore, the committee that is overseeing this construction is sending an urgent appeal to Hararis all over the world. Please see the appeal video and do your part. Together, we can make a difference. To watch it in youtube click here. As you can see from the video this is an ongoing project and the funding is needed urgently to complete the construction. The construction of this waqf ? a shopping mall ? will alleviate the chronic shortages that the school is currently facing and will allow it to grow and prosper giving a brighter hope for our people in Harar. When it comes to Harar, it is easy to complain why others don?t do this or that. The tough part is when it comes about us. Why are we not doing something to improve the education system? Why are we not making it easy for our people to stay in Harar by giving them the opportunity to build a state of the art educational facility, which the Shaikh Abubaker School is aiming to build once it completes the construction of the waqf? As you can see from the video, the residents of Harar with their meager earnings managed to raise 500,000 birr towards this project. The goal of this fundraiser is to raise 2 million Ethiopian birr, i.e., $232,600 USD calculated at an exchange rate of $1 USD = 8.6 ETB. Please bookmark this webpage for updates on this project. Even if you are students and/or unemployed and can?t afford to donate at this moment, please pass it on to those who can and be an active participant in taking part in this historic fund raising effort. For my part I am donating $250 towards this project, and HCO has donated 10% ($2000 USD) of its proceeds from Harari Day. 1.82% of the needed fund has been raised. 98.75% to go. When will you be part of the solution? May Allah make it easy for them and grant them and us all tawfeeq, ameen. Is there an update on the remaining balance as of January 2007? Unfortunately not much of progress to report. It shall be updated if there is any new information. To address the issue of timely updates, here's something I've been working on for a while now. It might make it easier for fund raising projects to give instantaneous input. Click this link to see a prototype funding tracker which lets you see how close a fund raising project is to reaching its goals. I will stress that the Abadir project had nothing to do with this. And the data may not be accurate.